I was thinking about generations yesterday as most of the country observed Martin Luther King Jr Day. My parents’ generation (and mine were on the younger side of it) – The greatest generation – born in the depression, fought and sacrificed in a world war. They buckled down at home, rationing, recycling, women working while men were off to war, building and gathering around a common cause. Were things perfect? Totally not so. There was much discrimination and inequality and when the men came back, women were sent back home or relegated to lower wage jobs. But here’s what I was really thinking about. I was pretty young when John Kennedy was assassinated. Such a clear moment even so, with all its somber ceremony and the unexpected killing of his accused murderer. Ruby died long afterward almost an afterthought. The young president, full of hope and vigor was not perfect by any means either but he was inspirational as a leader, even supported the arts. We remember his words today and his promise as a leader taken away too young. His successor, Lyndon Johnson took on the social missions that Kennedy had set out and accomplished much while simultaneously getting mired in Vietnam. He and his wife underscored the beauty of our nation and pointed out that we needed to preserve and appreciate it. Then Martin Luther King Jr was killed. Then Robert Kennedy was killed. I was older then, old enough that I was taken with the message of both men, too young to do much about it other than being inspired by the ideas. It was a blow to think that someone would remove such leaders from a world that so needed them. Then Nixon. Seductive in his promise of ending Vietnam. Slimy in almost every other way. There was a summer of his VP being against the wall and leaving. Then it all began to crumble around him. It was scary and yet the process – the hearings, the news reporting, and ultimately his resignation and replacement – was all orderly and reassuring. The constitution holds because people want what’s right and this isn’t. Like the assassination of Kennedy, everyone hoped we’d never go through anything like that again. I heard about a guy who wants to run for senate and he’s freaking 95. Come on – surely there’s someone younger available, and frankly I’d like to see some folks younger than me starting to come up. We need new ideas and energy and they need to start getting the experience. We had a young fellow recently as president and he got shut down by the politicos at every turn. And the current administration would apparently like to erase all traces of its predecessor for no other reason than he was black and young and smart. Anyway, I was wondering about the impact of losing those three leaders on our generation, with the dollop of September 11, 2001 on top. I think we are in need of new leaders to help us to action but in the meantime we only have us. Someday, my friends, I will apologize for having filled my social media with scary news stories, abominations of the current world and calls to action, but today is not that day. I can’t even say “just when you think it can’t get any more stupid/crazy/ridiculous/preposterous” anymore. Every single time the guy tweets he just makes it more surreal/absurd/beyond understanding. So today I was thinking about this progression and about yesterday’s attack in London and about 45’s responses and about the very pointed and mocking responses to his tweets and the very real effect of those tweets globally and more locally. Donald Trump, the forty-fifth president of the United States is a terrorist. One of the things that sets terrorism apart is the erratic, unexpected nature of it, along with the idea that such actions and the resulting fear it causes will disrupt normal society and life, making people willing to do extraordinary things in order to feel safe and normal again. Who do we have that does this on a regular basis? Yeah that guy. So consider this a reminder not to get bogged down by it all – do what you can to keep your own life on an even keel – resist in all the ways you can but don’t give up what’s important to you. It’s vital that we continue to resist and insist that our other officials represent us and do what is right. It’s equally vital that we keep on making art and enjoying the world and taking care of each other because that’s what really matters. A poem of necessity to start the day, we’ll see what the rest of the day brings. I think anyone who has ever made anything has had someone, sometime, make some flip, off-handedly bashing comment about it. Not always to the maker directly, not even considering that they or someone they know might be nearby to hear it. It just spurts forth into the ether. 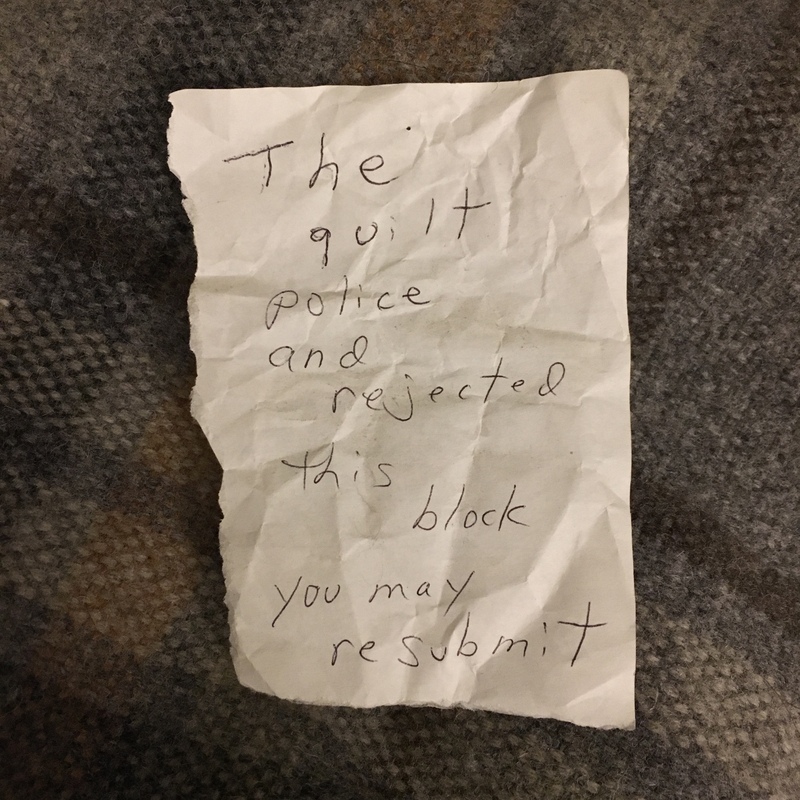 You might recall the summer’s incident where a viewer couldn’t just walk past a piece of art she didn’t like but complained and set off a chain of events where the exhibited quilt got pulled and then another one by the same maker got pulled etc etc. Outrage on one side and stupidity on the other ensued. Oops did I say that out loud? Sure did. Anyway, here’s a helpful list of things you might need if you find yourself reacting in more negative ways to some piece of art. This reminds me of a book I have read Pictures & Tears by James Elkins. Most of my readers don’t need this reminder but maybe we need the information to hand out as needed. You are not meant to like everything you experience. Art is often intended to be challenging, shocking, eye opening or outright uncomfortable.